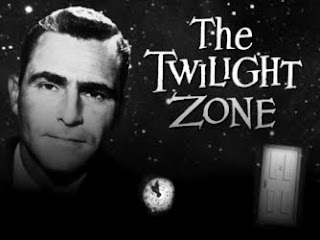 ♥ Soul of an Artist—Mind of an Engineer ♥: New Year's Twilight Zone Marathon! New Year's Twilight Zone Marathon! Exactly 50 years ago, with these words, the first episode of The Twilight Zone was airing on] American television, with its unmistakable tune. Television hasn't the been the same ever since. The Twilight Zone is my favorite TV show of all time. I've been obsessed with it ever since I watched "The Eye of the Beholder" in my seventh grade Honors English class. I was so intrigued by that episode. After that I researched the show as much as I could. When I found out about the biannual marathons on the SyFy channel my life was complete. Since then, I religiously watch them with my little brother and sister while munching on ample amounts of tortilla chips and salsa. So...If you're in the mood for some thought-provoking television, check out the annual New Year's Twilight Zone marathon on the SyFy Channel. This year it begins Thursday, December 31st at 8:00 AM and concludes on Saturday, January 2nd at 6:00 AM. Here is the episode-by-episode schedule. Grab some snacks and enjoy! Aw, that's awesome! too bad I missed it!